[Top] - This is a Hubble Space Telescope mosaic of 414 photographs of the nearest major galaxy to our Milky Way galaxy, the Andromeda galaxy (M31). The vast panorama was assembled from nearly 8,000 separate exposures taken in near-ultraviolet, visible, and near-infrared light. Embedded within this view are 2,753 star clusters. The view is 61,600 light-years across and contains images of 117 million stars in the galaxy's disk. 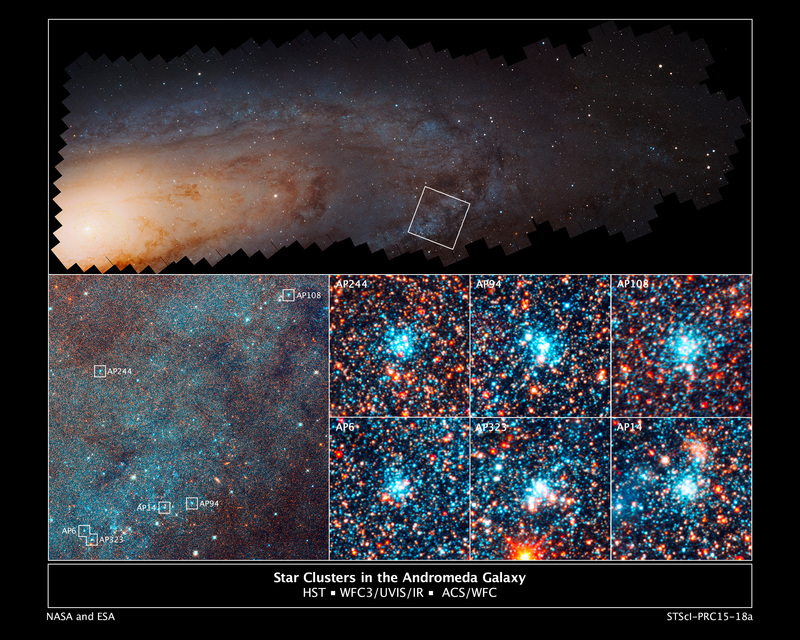 [Bottom-Left] - An enlargement of the boxed field in the top image reveals myriad stars and numerous open star clusters as bright blue knots. Hubble's bird's-eye view of M31 allowed astronomers to conduct a larger-than-ever sampling of star clusters that are all at the same distance from Earth, 2.5 million light-years. The view is 4,400 light-years across. [Bottom-Right] - This is a view of six bright blue clusters extracted from the field. Hubble astronomers discovered that, for whatever reason, nature apparently cooks up stars with a consistent distribution from massive stars to small stars (blue supergiants to red dwarfs). This remains a constant across the galaxy, despite the fact that the clusters vary in mass by a factor of 10 and range in age from 4 million to 24 million years old. Each cluster square is 150 light-years across.